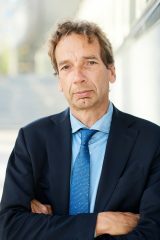 Shell’s departure from the Arctic is a very significant event in the global energy picture, writes Energy Post editor-in-chief Karel Beckman. It is another sign that the End of the Oil Age is in sight. 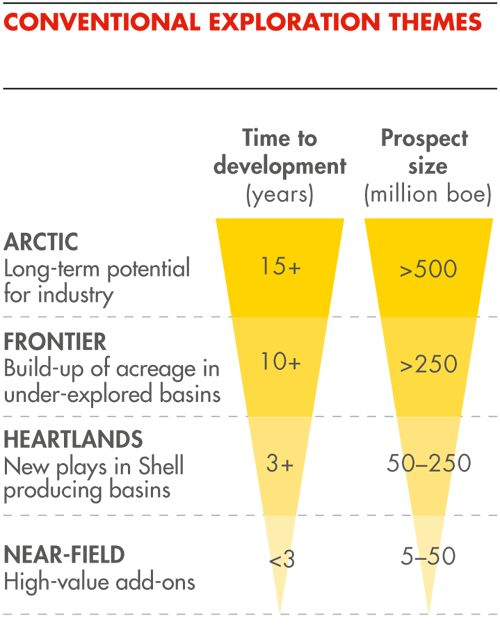 The Arctic, as this chart makes clear, was for Shell its land of destiny. This has now turned out to be a mirage. So where will the company turn next? You get a lease to legally search for oil in the strategic reserve of the USA. You drill carefully a very expensive well and you don’t find a significant amount that can return your investments. Invest for more more expensive wells or abandon the lease. * Oil price is low so new arctic production is far from profitable in the near future. * The very likely next president anounces she is opposed to arctic exploration. The best solution is then: take your losses and look for assets that have a better return in investment. Oil is currently very cheap, and far from a rare commodity. Hans, that’s all very well but look at the chart from their Investor Handbook. Where does this leave Shell? Arctic to them was a big Prize. What all this shows is that oil is becoming an ordinary commodity that a lot of people will be able to play at. Look at the most recent global shale oil figures put out by the EIA on 24 September. But Shell is not an ordinary company. The major oil players are not ordinary people. But they may have tp become like the rest of us! Shell is a junior player compared to Saudi Aramco. How much $50 is there left in the world? 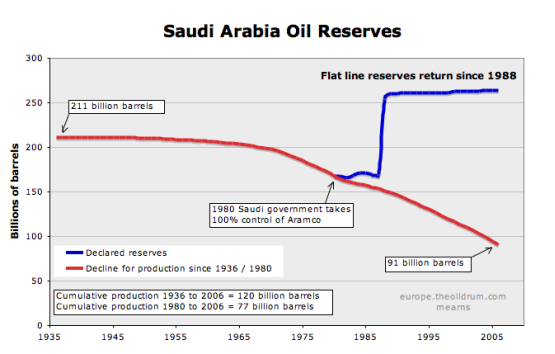 Saudi Arabia has had suspect constant reserves since 1988, which are due for a revision downward soon, which will hike up the oil price again. High oil price will bring the arctic back in the picture “soon”, the strategic reserves of the USA are in Alaska. Shell will be back, it’s currently a matter of survival and cutting cost. Wonderful, insightful analysis of ‘oil’. The story, perhaps, can continue with ‘gas’. The story leaves number of questions in the mind of readers about ‘gas’. Well, Shell is not in as bad a shape as Petrobras. So, it looks like a business decision. Dear all, there are certain signs that this is a normal transition phase in oil and gas’ history. The era of ‘cheap or easy oil’ is over, but people already were acknowledging this to the full. Shell’s decision is not remarkable at present, taking into account the current price settings of crude oil in the market, and the low gas prices. I would like to be very interested in the next years, if prices are again going to be increasing. 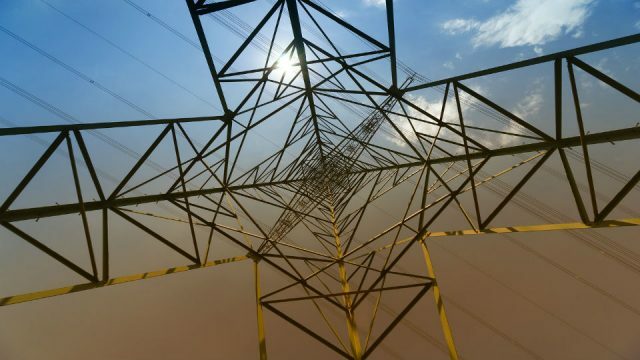 Low energy prices don’t bode well for energy efficiency. Competiveness of hydrocarbons with regards to alternatives have increased. At same time, most of the world, especially the emerging markets (and Africa!) are still fully focused on hydrocarbons. Their economic growth potential is so high that at current production figures, prices will increase, whatever short-going American financials are indicating. The end of oil and gas is not over at all. Demand is increasing, not as spectacular but still going up. At the same time, a growing amount of financial and production figures show that the hype in shale could be hitting soon its ceiling. US production is under pressure, and could go down within the next 12-18 months. To argue that the time of IOCs and NOCs is over, I feel this is ‘wishfull thinking”. The fact remains that most of hydrocarbons is in the hands of the same countries as before, including shale. 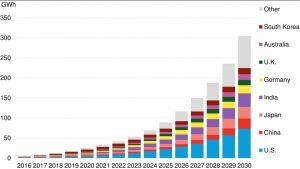 If you are taking into account that renewables (solar especially) could be a threat to the position of oil, this could just mean that the West is going to be confronted by the same bunch of parties as before. Main investments at present in solar are made in OPEC or non-OPEC oil and gas producing countries. Maybe a scenario is very feasible in which we will be importing hydrocarbons and electricity from the same OPEC countries (now maybe O&EPEC). Shell’s decision is not a watershed. It is a sane and rational business decision, taking into account oil and gas prices (maybe expecting them to stay low for several years), while also being pressured by the media and NGOs. Alaska’s legal environment is also not really attractive at present and with a possible Democratic new president this could even become worse for IOCs and Independents. Some even have indicated that the decision is a strategic retreat due to the media focus on COP2015 in Paris, Obama’s sudden green focus (while he opened up Alaska’s Artic oil search). My child even indicated “papa, it is clear why… It is becoming winter in Alaska”. Just some thoughts, not taking any sides, but time will learn if oil has peaked. I already am hearing this since the 1960s, but oil is far from peaking according to myself. 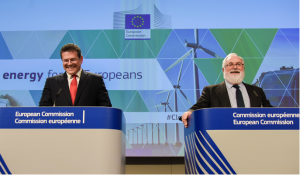 A renewed focus on CO2 issues and putting in place a working ETS would take out coal and promote gas for example! You’re right Karel, Shell’s departure from the Arctic is a very significant sign. 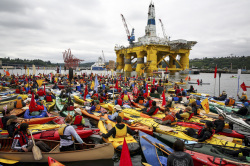 The next step for Shell: invest the billions that were earmarked for the Arctic (up to 2030) in renewables. The end of the Fossil Age is indeed in sight. Last saturday I drove to a wedding 200 km away, I attended the ceremony and the reception. I did the return trip on one fuel tank. 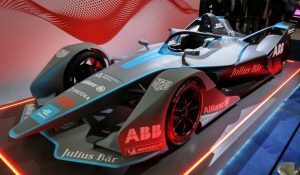 Make me an electric car that has a range of 800 km on a full battery and a recharge time of 6 minutes, for an unsubsidised new price of 10000 euros. Then I am your man. Uptil now its like buying a mobile phone in the 70s: A bulky gadget for the rich and famous. The emerging middle class in the emerging countries will need fuel for their cars, and lots of it, and electric won’t do for the forseeable future dor the above reasons. Hans, you are completely missing the point. As I wrote in my article, electric cars will grow gradually, eating away at the profit margins of the oil companies, just as wind and solar have been eating away at the profit margins of the conventional power generators. It is nonsense to assume a quick change from oil to electric. The system is huge and it will take decades. But as it is happening, it will put a ceiling on oil demand growth. By the way, I was speaking to a Shell executive the other day arguing this point and he just nodded his head. They know they are in a fix. mr Beckman, this is wishfull thinking. The future cannot be predicted. Next: wind and solar eating away profic margins of electricity companies.?????? Say, you are a proud manufacturer and give warrenty on your products. Of course this warrenty ends as soon as customers start modifying your products. But the electricity companies have to accept that energy is dumped on the grid and they keep responsible for the right voltage. Totally absurd. 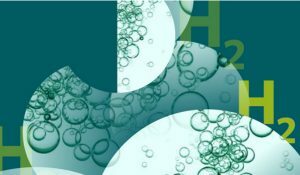 The upper limit of chemical energy storage is 700Wh/kg. So, a car will never be able to drive more than 5km at 1 kg of batteries. Electric driving is in it’s infancy and only suitable for in town traffic. Karel’s piece on Shell Oil’s retreat from the artic reminds me of a discussion I had in the late 1990s with the chief strategic planner for Texaco. I had been invited to brief Texaco planners on renewable energy technologies and did so for over six hours. During a break in the proceedings, over coffee, the chief planner said something to me I’ve always remembered: “We’ve been an energy company for a long time and we intend to be an energy company well into the next century. But we cannot continue to be just a black oil company.” Karel is saying that Shell finally sees that future coming, just as Texaco did many years ago. Sure Shell’s decision is a “rational” business decision (although I might add that it is coming very late and I would not be too pleased as shareholder at the waste of money), but even a business decision can be significant in the wider picture. I did not say oil would peak, I am saying oil demand is peaking. I would like to make the comparison between what is happening now with companies like RWE. A relatively small amount of renewables hit into their profit margins. That’s what I think will happen in the oil sector. Companies like Shell need very high profit margins, that’s what their shareholders demand. 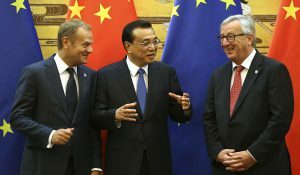 China and the US are going in a new direction – the importance of oil geopolitically and economically will wither away. But we will see how it goes: I have been wrong before! Which, by the way, leaves gas: that could still become a saviour for Shell, if they can make the BG takeover to work. But I doubt that we will ever get to a An Age of Gas like we had for Coal and Oil. Oil will be needed for centuries. Our complete transportation system runs on oil and there is not the smallest indication this will change in the next decades. I take issue with David Dirkse’s position. Sure, liquid fuels with high energy density will be required for some forms of transportation, e.g. In aviation and many military applications. But as the world begins to get serious about addressing global warming and climate change there will be new policies introduced to reduce use of petroleum and its carbon emissions. Personal transportation vehicles will be increasingly electrified and biofuels will replace traditional petroleum as an energy source. 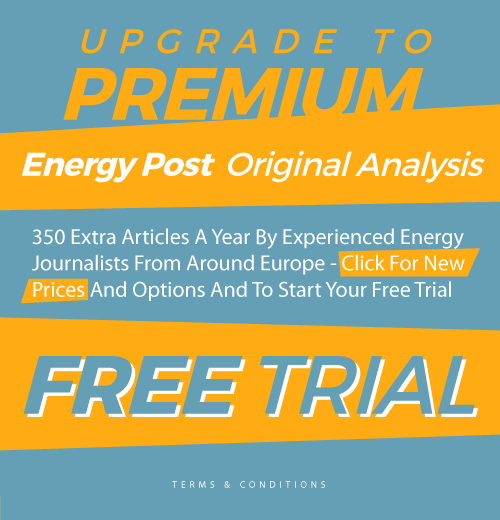 Admittedly this will take time as there are many vested interests in our current energy system, but the trend is clear and the latter part of the 21st century should see major changes from the world Dirkse foresees. Thank you for your honest reply. 4. the limit for battery power density is 700Wh/kg so a car can never drive more then 6km on 1kg. 10 the main purpose of religion is a firewall against fear. 11. environmental institutions have replaced the church and have replaced hell and pests by climate change. 12. don’t have yourself brainwashed . AGW has become the new state-religion because it suits beaurocrats. They now may raise taxes and take control without being held accountable because the objective (saving the planet) is such a morally high objective.